NOTE: The above REFURBISHED Unit is AVAILABLE for sale, while quantities last. The BioTec2000 Frequency Instrument is NOT just another made-over Frequency Generator, but is built to the HIGHEST Standards of the Professional Scientific Research Community. Inspired by the PROVEN Technology pioneered by Royal Raymond Rife and manufactured by his Rife Virus Microscope Institute in the 1950s, the BioTec2000 Frequency Instrument brings Rife Frequency Instrumentation into the 21st Century. Sworn Testimonies VALIDATE the EFFECTIVENESS of this PROMISING Electromagnetic Technology! The BioTec2000 Frequency Instrument - The Future Is HERE Today! 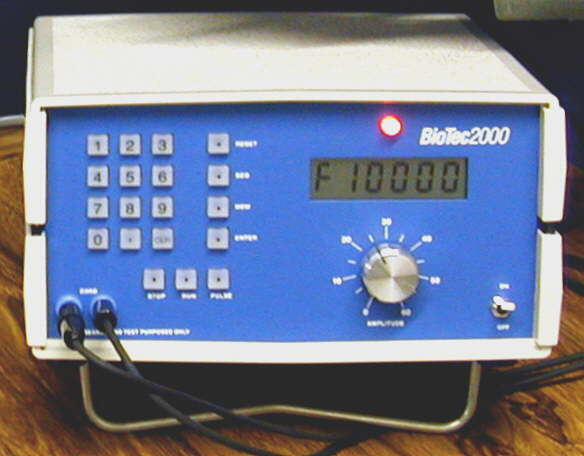 The BioTec2000 Frequency Instrument can be used for Experimental Use on Viruses, Fungi, Parasites, and Metabolic Deficiencies, such as Arthritis, Headache, Insomnia, Diabetes, High Blood Pressure, Psoriasis, Major Pain, Wound Healing, Depression, Kidney Insufficiency, Joint Injuries, Thrombosis, Spondylitis, Fatigue, Emphysema and MANY other Health Problems. NOTE: The above BioTec2000 Frequency Instrument is a Stand-Alone Unit and uses Foot Plate Electrodes, Hand Cylinder Electrodes and/or Skin Electrodes to DIRECTLY APPLY ANY Frequency to ANY particular Area(s) of the Body, where this applied Frequency is NEEDED. Bipolar Square Wave 8 17 1 min. - 39 mins. In a MAJOR Advance OVER MANY other Frequency Units, the BioTec2000 Frequency Instrument has qualified for a SPECIAL UL Listing, "544 Patient Connected"! The Ability to RAISE and SUSTAIN a 60 Volt Output (Peak-to-Peak) WITHOUT using a Transformer! NOTE: A Transformer can CUT OUT the HIGH Harmonics, which are VERY ESSENTIAL to Rife Technology. INNOVATIVE Circuitry to produce a VERY RAPID Rise Time for Harmonic-RICH Impulses! Memorizes your FAVORITE Frequency Sequences, so that you can run them ANYTIME! INFINITE Push-Button Tuning from .5 Hertz to 39,999 Hertz (cycles per second) with a Fraction of 1 Hertz Increments! NOTE: A Researcher will be ABLE to tune the BioTec2000 Frequency Instrument to ANY Frequency or a Fraction thereof for the MOST PRECISE Investigative Work POSSIBLE. This is EXTREMELY IMPORTANT, because there are MANY NEW PROVEN Frequencies, which CONSTANTLY become AVAILABLE! And because of that Fact, our Frequency And Procedural Manual is UPDATED 1 - 2 Times per Year. Also there are MANY Frequency Units available today, which are ALREADY "Pre-Programmed", NOT allowing you to select ANY of the NEW Frequencies and among those Units, there are even some with which you use Codes, so that you don't even KNOW what the Frequency is, that you're using! The BioTec2000 Frequency Instrument can also be "PULSED" for Non-Microbial use! 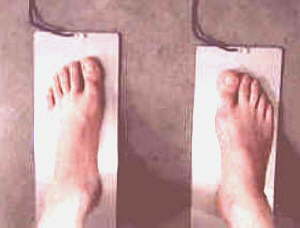 NOTE: Some Researchers have found that if a CONTINUOUS Square Waveform is used, the Body will tend to accommodate itself to the Frequency, so that the Frequency then, which is used, NO longer has ANY Effect on the Body, but that with a "PULSED" Square Waveform Output, the Body does have the Time, that it NEEDS to work in BETWEEN the Pulses! AUTOMATICALLY operates the Frequency, Time and Amplitude by first programming in Frequency and Time on up to 8 Memory Channels with up to 17 Sequences per Channel. Front Panel Includes: L.E.D. Pilot Lamp, Liquid Crystal Display (Six Digit), ON/OFF Toggle Switch, Amplitude Control, and Banana Jacks (2), plus Push Buttons - Touch Pad (12), RESET, MEM (Memory), SEQ (Sequence), ENTER, STOP, RUN, & PULSE. Standard Accessories Include: Hand Electrodes (2 - Stainless-Steel Cylinders), Foot Electrodes (2 - 5" X 12" - 18 Gauge Stainless-Steel Plates), Skin Electrodes (2 - Self-Adhering Reusable Carbon Rubber Pads), 2 - 2 cond. Cables (4' & 6'), 4 - Banana Plugs, 12 Volt Power Supply, Operating Instructions (2 pgs. ), & Frequency And Procedural Manual (100+ pgs.). Dimensions: 4 7/8" H. X 8 1/2" W. X 9 1/4" D.
Warranty: 2 Years on Parts and 2 Years on Labor. NOTE: Before you purchase the preceding BIO-ELECTRONIC STIMULATOR, please read ELECTROTHERAPY DEVICE - DISCLAIMER & PRECAUTIONS. If you want to know your LEGAL 9th Amendment Medical Rights, then please read NOTICE AND DECLARATION! Also if you're a Healing Practitioner, then please read UNAPPROVED MEDICAL DEVICES - EXEMPTIONS. Reading The Operating Instructions For The REFURBISHED BioTec2000 Frequency Instrument, Then Please CLICK HERE. Knowing Why You Would Want To Choose The BioTec2000 Frequency Instrument, Then Please CLICK HERE. Seeing The REFURBISHED BioTec2000 Ray Tubes Unit, Then Please CLICK HERE. Ordering The REFURBISHED BioTec2000 Frequency Instrument And/Or The REFURBISHED BioTec2000 Ray Tubes Unit, Then Please CLICK HERE. REFURBISHED BioTec2000 Frequency Instrument: Orig. Retail Price-$1595/Your Cost-$850.00. REFURBISHED BioTec2000 Frequency Instrument + REFURBISHED BioTec2000 Ray Tubes Unit (Orig. Retail Price-$1495/Your Cost-$750.00) = Your TOTAL Cost-$1450.